B|ta'arof Magazine releases an audio mix twice a year. For each, we ask deejays, producers, engineers, and collectors to draw on their passion and expertise in sound and Iranian culture to produce mixes that express their artistic vision. Audio Engineered by Kamal Humphrey (RadioInactive) at Flying Carpet Studios, Los Angeles. Mastered by Bob Lanzner at Technovoice Mastering, Studio City. Sheila Walizadeh, Kamal Humphrey and Arien Valizadeh for their guidance. Leticia Castaneda, DJ ESP, Amos Natkin, Spoon (of Iodine), Clifton Cameron and Tommy Mofid for their audio contributions. Ata and Nahid Walizadeh, Kikhosrow Behrozi, Hadi Salehi, Reza Abadi, Nadereh Salarpour, Ruby Emam and Jennifer Matiran for helping find the source material. Arash Davari and Golnar Nikpour of B|ta'arof Magazine for their support. This one's for you Remy Siamak. To complement the release of our inaugural issue, we asked Contributing Editor Arash Saedinia — one of the curators behind the acclaimed Pomegranates compilation — to produce B|ta'arof Podcast #1. Saedinia collaborated with producer, deejay, and audio engineer Pejman Firouz of TrueGrooves Productions. We present the fruit of their efforts alongside the following notes by Saedinia. Here are fifteen Persian Pop songs from the sixties, seventies, and eighties. The mix includes thirteen chehel-o-panj-dorehs released on the Iranian imprints Ahange Rooz, Apollon, Fine Music, Harmony Apollon, Juliet, Monogram, Pars Record, and Royal, bookended by two long player tracks produced in the United States for the labels Mainstream and Soundex. It is fitting, for a magazine of Iranian culture produced in diaspora, to begin and end with records made by Iroonis working abroad with non-Iranians. 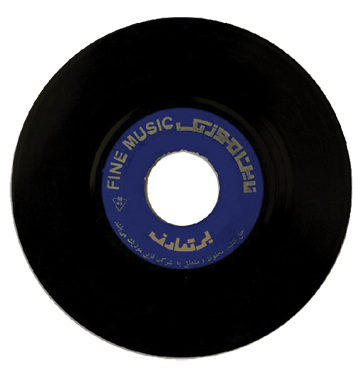 Efforts to eradicate Persian popular music have made the preservation of pre-revolutionary Iranian records difficult and necessary. I am forever grateful to my mother, Efat Sanai, for saving her records. A collector by nature, most of what you hear — torch songs, beat rock, soundtrack vignettes — originate from a cache kept in a red suitcase, stowed for over thirty years. Though many were carefully preserved in crisp picture sleeves, most bear the marks of heavy use. I asked Pejman Firouz to transfer the recordings to a digital format and mitigate the effects of wear on the records I chose, particularly the forty-fives. Pejman gave generously of his time, energy, and enthusiasm, recording and re-recording the records, mastering and editing the tracks, mixing and engineering the final result. Pejman's effort is a gift of friendship I will not forget. Damet garm, Pejman. Here are fifteen songs that tell a story. The story's theme is longing, which is, of course, the primary obsession of Persian Pop. Enjoy.